We're incredibly excited to finally introduce to you our newest product: ButterPods! 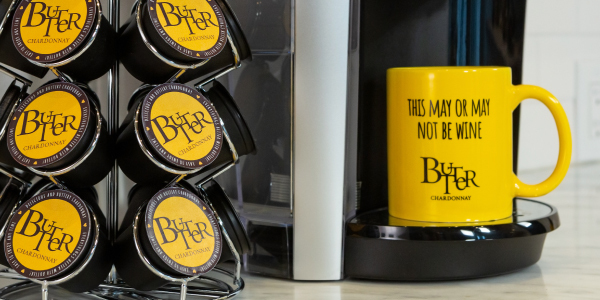 A single-serving pod of Butter Chardonnay that is freshly prepared and chilled in your single-serve coffee maker. With the introduction of this newest product, we're able to offer another simple solution to having fresh Butter anytime, whether at home or at the office, without having to open an entire bottle! Feet up JaMFans, we’re going shopping... online! It’s your lucky week because we’re rolling out the best news: Everything in our online JaMStore is 20% off all week long! Yes, you read right, now’s your chance to score your fave JaM wines including bottles of super-sippable Butter Chardonnay, JaM Cab (perfect for summer BBQ’s coming up!) and our new bestie, California Candy Dry Rosé. Still can't find those #ButterCans or #CandyCans? Now's the perfect time to have them shipped right to your doorstep! But you know the drill, more Butter is always better - so now's the time to stock up and take advantage of our super-saving shipping deal! It’s the perfect sneak-peek experience into our special club. And we want YOU. 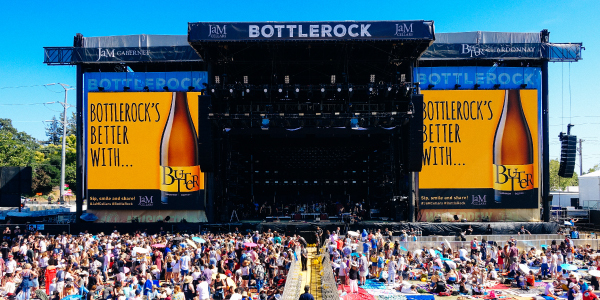 Tickets to come see us live at the JaMPad at BottleRock 2019! Want deals like this all year long? We’ve got you covered with auto shipments and great perks—who says money can’t buy happiness? Want to mix n’ match your selection? No one puts Butter in a corner. Mix your selections up! We can’t wait to show you all the good stuff. Ready to JaM with us? Sign up for the JaMClub to get the good times rollin’! Springtime is bringing us flowers, patio weather, and the perfect excuse to open a bottle of Butter Chardonnay (like we need a reason!). It’s this time of year that reminds us to #SpreadtheLove as we leave behind wintry doldrums and welcome the anticipated fun of the seasons with our nearest and dearest. It’s time to get together and get real—over wine, of course. The moments we share between sips bring us together—both silly and serious. So let’s forget about freezing rain and April showers, the only thing we want to be pouring now is another glass of Butter! Cuddle-Up Convos | Break out of the winter routine with your sweetie and catch up for real. Whether it’s on the couch, while you’re making dinner (a.k.a. dialing up UberEats….no judgment! ), or soaking in the last rays of sunshine after work, grab a couple of govinos and make time to remember why you like each other in the first place. Can’t go without: Rolling Stones or The Beatles? Spend a Friday night at: Dueling piano bar or karaoke? Would you rather: Direct the blockbuster movie of the summer or write a NYT best seller? Butter Up Your Bestie | We all have that one friend you can always count on for: Happy Hour; showing up with Butter and ice cream; a good break-down, or build-up (depending on the day). You know the one. Your bestie is your ride-or-die…and all the jokes are inside. Butter time is a great way to show her what she means to you. You’re already texting her, right? Shake off the indoors and dust off the porch swing—sip as you watch the world go by and the daffodils bloom. Love and Butter are best when shared. 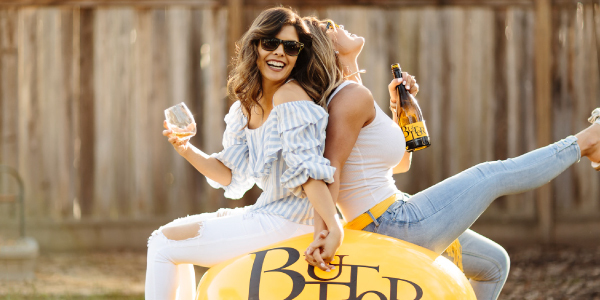 Come out of hibernation and tag #JaMCellars as you #SpreadtheLove with those you can always count on to share a bottle of Butter with you, no matter what! When the clock strikes Wine, you know that it’s Butter time. It’s official: studies show that drinking a glass (or two) of wine tops the list of “Life’s Little Pleasures,” with 65% of America voting it in the Top 20 best little treats. We couldn’t agree more! You know what they say… We hear it’s always “5 O’Clock somewhere,” but it turns out that 6:59 pm is officially America’s preferred time to enjoy a glass of wine. You’ve got that right! And we’re not saving it just for the weekend either. You can find almost half of wine-drinkers in the US enjoying a glass during the week as well. The jury is still out on what is more enjoyable…51% of our fellow American wine-drinkers choose to open a bottle for some “me-time” when Wine O’Clock strikes. 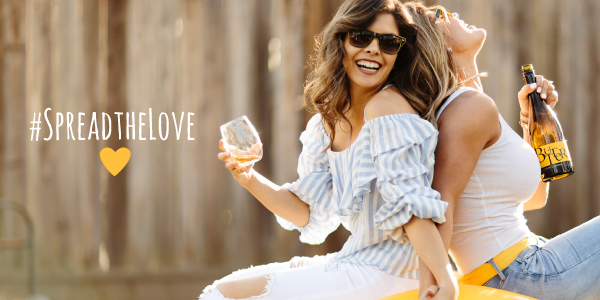 But Wine Time can also be more fun with your other half- whether that’s your sweetheart, your bestie, or your sister! If you had to pick the best spot to enjoy a glass wine, where would you go? When it’s officially #WineOClock (hello 6:59pm!) here are our favorite ways to enjoy a glass and quality time with those near and dear to our wine-loving hearts. When you finally have the house to yourself…you know what to do. Bring on the Netflix and Chill and leave the pants behind. Butter is your bestie for the night, and that wine-d down time is essential! Wine Talk: If you could only listen to one band for the rest of your life, who would it be? We want Candy Dry Rosé, and we want it in a bikini. Who says you can’t have it all? Nothing goes better than your bestie, some rosé, and time spent lounging by the pool. Wine Talk: What is more essential for a festival-ready wardrobe…the perfect sunnies, or a fabulous pair of shoes? Who says sparkling wine needs an occasion? Make a Tuesday night special with your sweetheart by cooking up a meal, raising a Toast, and celebrating the fact that you don’t have to go a day without wine! We’ll cheers to that! Wine Talk: If you could plan the perfect Friday night, what would be it…dressing it down with a little Netflix and Chill, or pulling out the stops for a night on the town? So now that it’s official, don’t forget to mark your daily calendar with Wine O’Clock, grab your fave bottle and catch up on the quality time with yourself or your best ButterLovers to wind down your day. Curious about how everyone else is enjoying their Wine O’Clock? Check out the survey results here! We know you won’t forget when the time comes…but just in case, make sure you tag #WineOClock and #ButterChardonnay while you’re sipping to enter to win our darling Butter Clock and never miss a glass again! Our first sip of California Candy Dry Rosé last year made us swoon. It’s back and even easier to adore. Yes, you can #RoséAllDay with CandyCans! Whether you’re kicking it at the beach or packing a few in your backpack to sip on-the-go, these cute and convenient cans will go with you, wherever your next adventure takes you! Pinkies up, get those govinos out! Even better, grab a reusable straw like these adorable striped ones to get selfie-ready (and save your lipstick, obviously). All the rules are canceled, and easy-breezy fun is game on when we’re sippin’ on CandyCans. Keep your eyes on your local wine aisle as these adorable 250ml cans make their way on to a shelf near you! Want them now? Want them delivered?? Shop through our online store and pay no additional shipping when you order two 4-packs or more! Once you have CandyCans in hand and you’re ready to party, tag us with your happy face using #CandyCans and #CaliforniaCandy online. We dare you to stop staying #IWantCandy all rosé season long! Movie night is always better when there’s popcorn and Butter and we can’t wait to see who takes the stage at #Oscars2019 to relive all our favorite movies from this year! Will they really make us choose between Bohemian Rhapsody and A Star Is Born for Best Picture? Somebody grab the govinos and the girls and roll out that red carpet, we’re celebrating the Oscars, JaM-style! • Brush up on your Oscars history: Give yourself a refresher on some iconic Oscars moments (remember when JLaw ate it on stage?! We feel you girl) with a quick recap on the most iconic moments in Oscars history. • Remind guests of the dress code: Watch the stars dress it up while you get comfortable for the show. PJ’s are a must; Butter yellow robes and bunny slippers are highly encouraged. • Welcome to the Open Bar: Set out plenty of Toast Sparkling and let your guests get creative dressing up their drinks with a champagne bar fit for a movie star. • Fine (Finger Food) Dining: make prep (and clean up) a breeze with all your food from apps to dessert on a stick, like these meatball subs and these strawberry shortcake treats. • “And the award goes to…”: Offer an award for “Best Dressed PJ” contest. Fancy-up a bottle of Toast with glitter and hand it off in style to the winner. Aren’t we all stars tonight? We have never been happier to see that extra hour of sunshine, and it couldn’t have come a day too soon! Daylight Savings Time “springs” us forward on Sunday, March 2nd which might mean we lose an hour of sleep, but we’re getting an hour of sunlight back to do whatever your Butter-loving heart desires. We’ll take that trade! Need some inspiration on what to do with the rest of your bright shiny day? We have a few ideas for ways to spend that extra hour of sunshine! • Make the day a celebration with a bottle of Toast as you watch the sunset. • Get outside and BYOB (Bring your own ButterCans!) to reward your adventure, whether you’re out for a hike, or stealing a bit of sunshine at the park. • Pack that picnic and fire up the grill with JaM Cab and BBQ by your side while you enjoy that extra hour of sunlight. Enjoy the extra wine-time with those Butter-yellow sunnies on…you deserve it! We’ve got Spring Fever, and the only antidote is warm weather and a chilled glass of Butter. Are you with us? 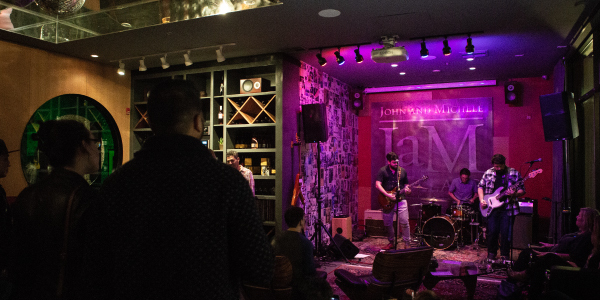 Say goodbye to winter, and bring the heat as we bring in hot talent every weekend to the JaM Cellars Wine & Music Studio in Downtown Napa. Thursdays and Fridays from 9PM-midnight we’ll be March-ing to our own beat all month long as we bring in a range of artists like indie-inspired Zak Fennie & Friends, and Terry Family Band. We’ll be getting down with Groovy Judy’s funk Hendrix funk rock tunes and stepping it up a notch with rock ‘n roll-er Roem Bauer. You can always check out our events page to make sure you don’t miss a beat on our next session at the studio. Join us to sip by the glass, or by the bottle on easy-to-love wines Butter Chardonnay, JaM Cabernet, California Candy Dry Rosé and Toast Sparkling while you kick back on our cozy couches and enjoy the show like you’re part of the band! Look, Galentine’s Day might be a fictional holiday that we stole from a TV show (Cheers to you, Parks & Rec!). But what is that to stop us from celebrating our best gals? Bring out the Butter and leave the husbands and boyfriends at home…we’re doing brunch. - Ditch the New Year diets for the day (if they haven’t already fallen off!) and dive in with endless glasses of Butter and a Potluck Dessert Party! Everyone brings their signature dessert for a day of sweet and sassy fun. (Yes, Karen, you can make those paleo brownies. We’ll pretend they’re full fat). - Bring back a camp favorite and get supplies for friendship bracelets. Bust out your boxstitch skills for the squad and make sure you make a wish when you tie each other’s bracelet on! - Hidden Talent Show: you might need an extra bottle of Candy for this. Tell the girls to come prepared to show off their secret hidden talents. Just when you thought you knew everything about each other, there’s always something hilarious to learn! Don’t forget to snap enough selfies to commemorate another day of loving those gals who always know when to show up to your doorstep with wine when you need it the most. If we hung out and didn’t selfie…did it even happen? Make sure you tag us #JaMCellars so we know it’s real.